The Adriatic Coast has enchanted beach-lovers for centuries. 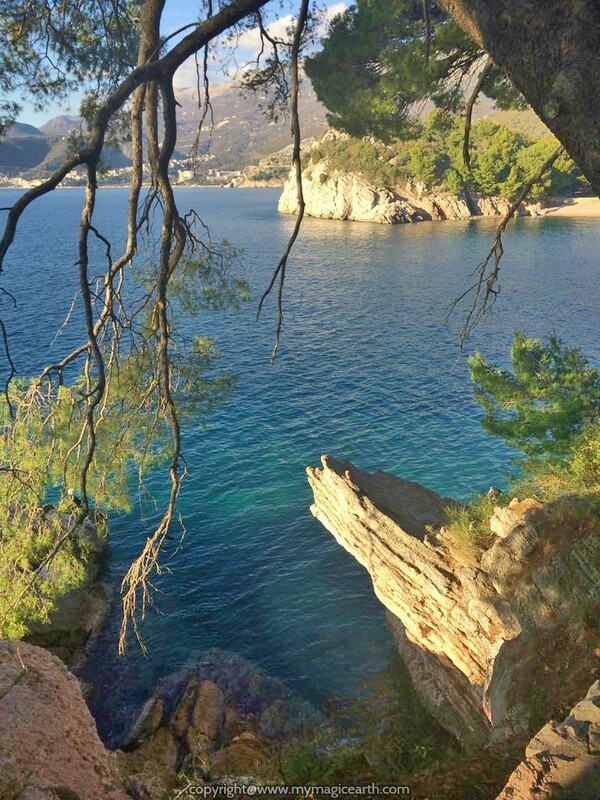 The entire coastline of Montenegro is stunningly scenic. Beaches, old villages, and islands spread over the coastline. 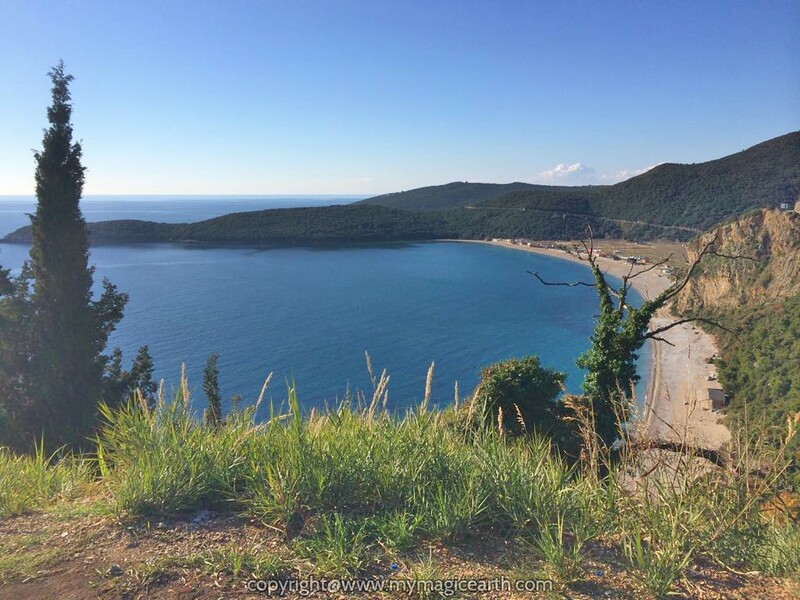 Therefore, the 3rd day of our Montenegro road trip was to look around the Adriatic coast. It was sunny with the air temperature of 18°C. Longing to see the sun-kissed Adriatic coast we got up early and set off to the first place of the day, Jaz beach. The beach has magnificent open sea views. The forested hill extends to the sea gently. The deep-blue water and light blue sky form the perfect contrast. It’s got ample parking and is a large cove. It’s a mixture of pebble and sand. The whole beach is over a kilometre long. In summer, there are loungers and umbrellas for hire. But there are also free areas where you can set up your towels. This beach is great for kids. You can hire peddle boats, kayaks, and jet skis too. However, at this time of the year, there was no single tourist and no single activity in sight. We stopped at a roadside and entered an abandoned house from which we could have the view of the Mogren beach. 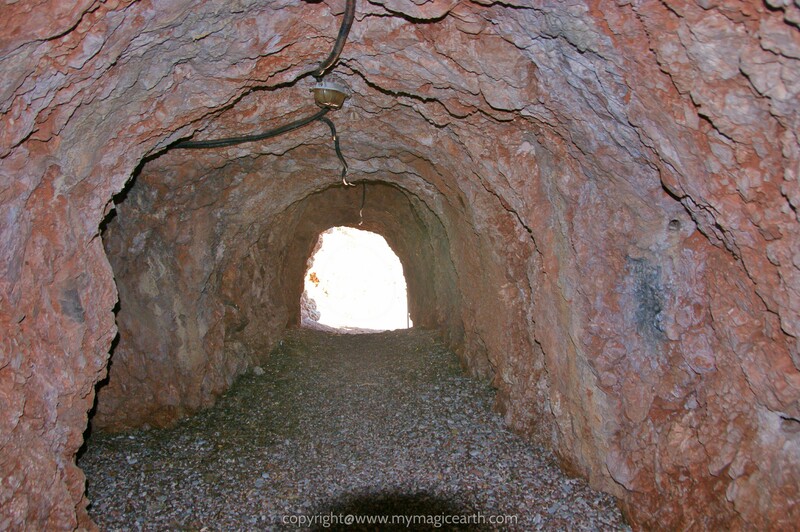 Mogren consists of two sandy beaches, a few hundred metres long, connected by a short tunnel. It’s only 200m from the old town, so the two beaches are easily reachable by a pedestrian walkway from the direction of the Old Town Budva. The beach has medium grain sand. Mogren Beach has no single building. In winter this part of Adriatic coast is virtually deserted. From the abandoned house we could also see the Richard’s Head beach next to the walls of Budva old town. The name sounds weird to me. It was named after actor Richard Widmark who filmed ‘The Long Ships’ in Budva in 1964. 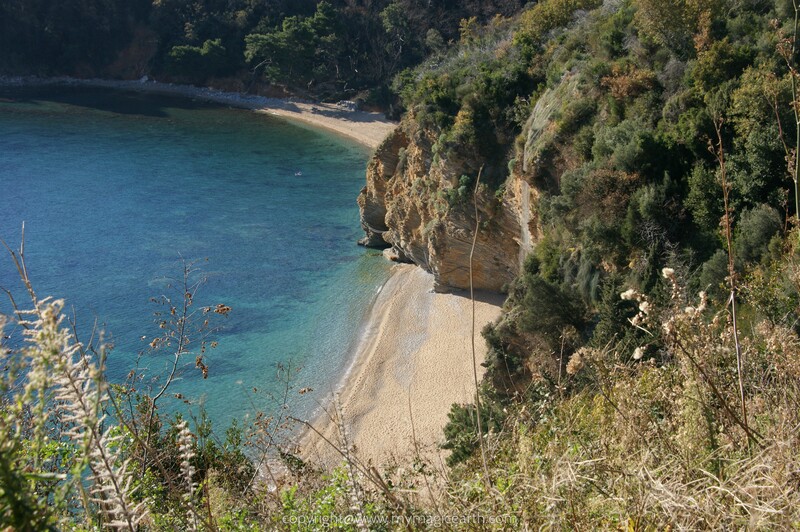 Budva has several beaches around. 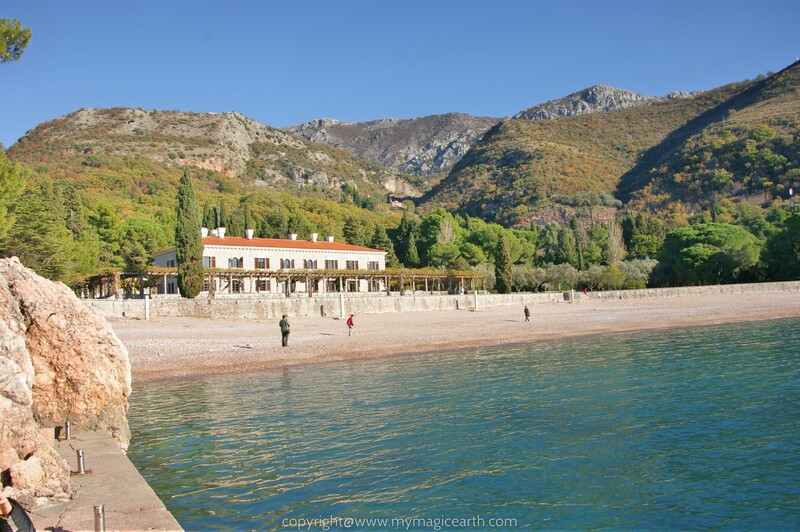 For example, Pizana, which is a 50m stretch of beach at the end of Budva marina. Or, Slovenska Plaza, which is the largest of the Budva beaches. It’s 1.6km / a mile long and runs the whole length of Budva from the marina to Dukley Gardens. We continued driving along E65 and passed Przno. 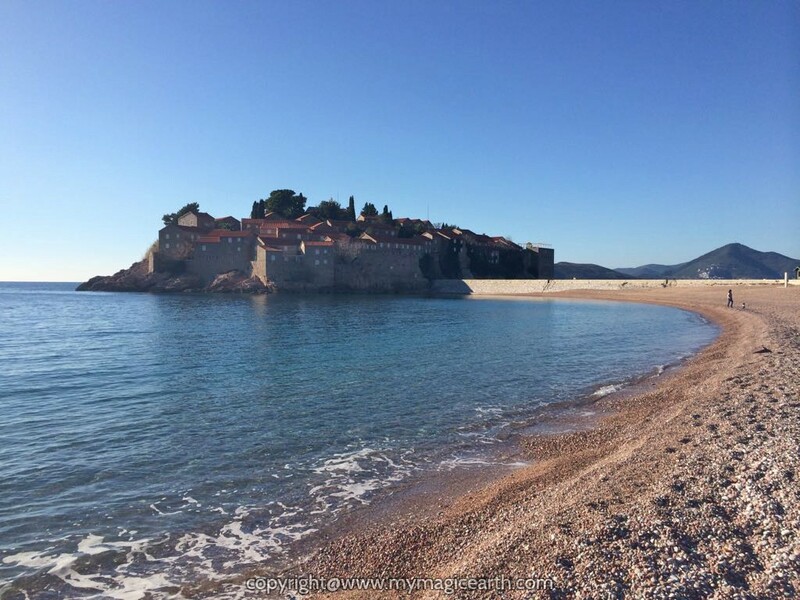 Having parked our car outside of Przno, we started the coastal path to Sveti Stefan island. The walking path is marked on a map presented on an information board. It also has the following information: “We kindly ask you to use only roads and pathways designated for public use. All other ways are private.” The round walk includes an upper path and a lower path. On the way to Sveti Stefan island, we took the lower path. The first sight we passed is Vila Molicer. Vila Molicer is a 5-Star hotel surrounded by wooded area. In front of this hotel, it is a flat beach area. There is a short tunnel not far from the hotel. It leads to where boat parks. From Vila Molicer we headed south towards Sveti Stefan island. Along the wooded path we had glimpses of coastal views. At the end of the wooded path there is an eatery called Olive Café near the Sveti Stefan beach but reasonably priced. 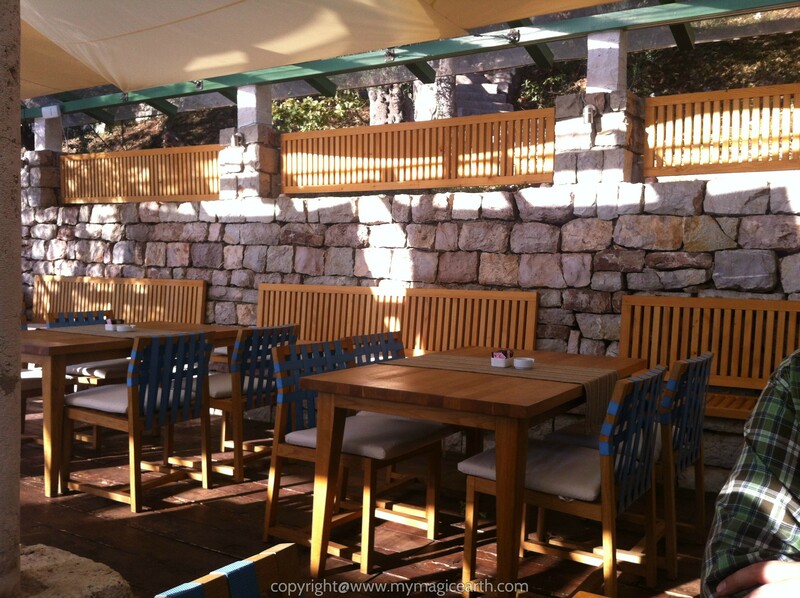 With beautiful views to the Sveti Stefan island and beach the café restaurant has the perfect position. When we entered into the restaurant a group of wedding guests were just on their way to leave. Though it was past lunch time the waiters were still actively stand-by for taking orders. Our stomachs were rumbling so we decided to eat there. Tasting the delicious food and soaking in the sun shine were the best choice for our break. 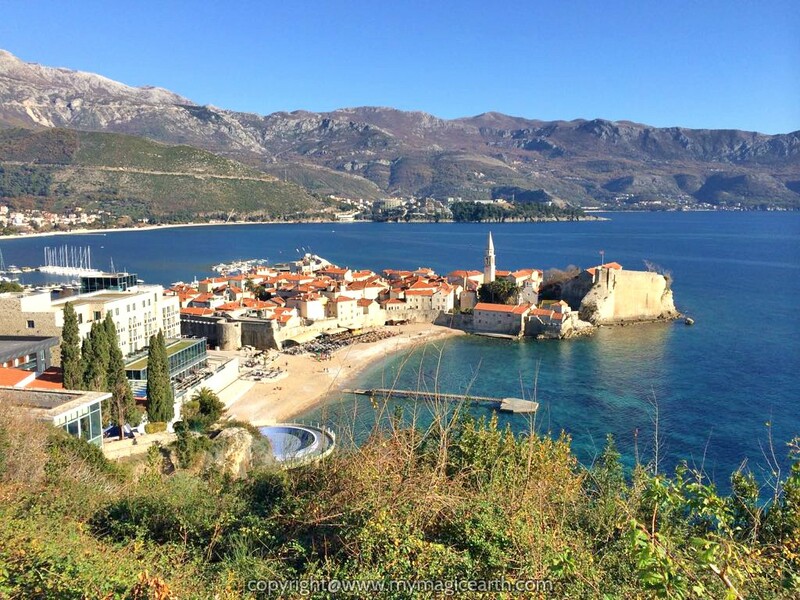 In the late afternoon, we planned to visit the little jewel of the sea Sveti Stefan. It was an island but is now connected to the mainland by a narrow piece of land. Unfortunately, Sveti Stefan is closed to the public. It is now a luxury hotel. Only hotel guests are allowed to enter the island. You can book this hotel here. On the beach, there were no waves to be seen. We walked around the beach to enjoy sun baths and breathed sea air for the rest of the afternoon. On the way back to the parking place we took the upper path. The entire coastline is full of tourist resorts. When we walked along the Budva beach area, we spotted many apartments and hotels, for example, Marinero Apartments. The property is just 4 minutes walk from the beach. The beautifully furnished apartments feature a seating area, cable TV and a fully equipped kitchenette. The popular Mogren Beach is 500 m from Apartments Marinero. It dominates one of the most picturesque neighbourhoods in Budva. Couples particularly like the location, they rated it 9.2 for a two-person trip. For further details about this apartment, please click here. In general, there are many hotels and apartments along the Adriatic coast. To find a good offer, please check the following platform.